As dry as my skin may get and as chapped as my lips have known to be, I try really hard not to use chapstick. Why? I read somewhere that the more you use it, the more your lips rely on it. I didn't want me lips to NEED chapstick so therefore, I just ignored my bleeding lips. Just recently I was sent some fantastic organic lip balm from EOS (Evolution of Smooth). I really like the Sweet Mint flavor as it can also double as a mild breath refresher too. You know what I mean, right? Anyway, I really love the cute sphere shape that the lip balm comes in. It sure is a conversation starter. Everytime I bring it out my friends ask, "oh, is that your organic lip stuff?" I also get, "what the heck is that?" Cool packaging EOS. What else do I appreciate about it? Another cool thing....you can buy them at Walgreens! So many times I find something that I love only to discover that I can only get them online. Not in this case. You can head over to your neighborhood Walgreens and get some organic love! 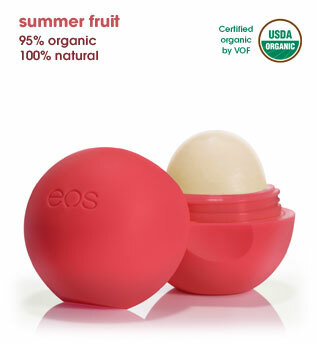 How would you like to win some EOS organic lip balm? Well today is your lucky day. Head over to EOS and tell me which flavor you prefer. Thats it! Just leave your email address too so I can contact you when you win. This contest will end on May 14th at NOON EST. Good Luck! It is open to US entrants! Oooo I want some:) I would probably prefer the sweet mint flavor, nothing wrong with the classic for this chapstickaholic. I prefer lemon drop :) *Thanks* for the giveaway! I would love to try the lemon drop spf 15 flavor. Hmm, hard to choose, but i think I would go with the sweet mint too! found your site through my sis in law, her tweet! entered in the Livie and Luca shoe giveaway! entered in the 3 wilton gold pans giveaway! entered in the organic sprout giveaway! I found u by doing a Google Search for a specific giveaway. I prefer Lemon Drop. Thanks! I would love the lemondrop! I found your site through your link on my site! lemon drop w/SPF 15 sounds great. Not sure how I found your site. It's been quite a while and I'm sure it related to one of your product reviews. I'd like to try the summer fruit flavor, thanks! I like the Honeysuckle Honeydew. I like the summer fruit! Cool looking product...I'd like Summer Fruit. Thanks. I prefer the honeysuckle honeydew. Thanks! I entered the Sula Organic Shea Butter giveaway. I like the summer fruit flavor. #1 I subscribe to your Feedburner Email Subscriptions. #2 I subscribe to your Feedburner Email Subscriptions. I entered your Wilton's UltraGold Bakeware giveaway. I entered your naturaworld All Natural 4 Piece Crib Set giveaway.